A C-130 Hercules heavy air tanker is one of several planes dropping retardant on the 416 Fire. The plane, owned by Coulson Aviation, is stationed at the Durango Tanker Base. 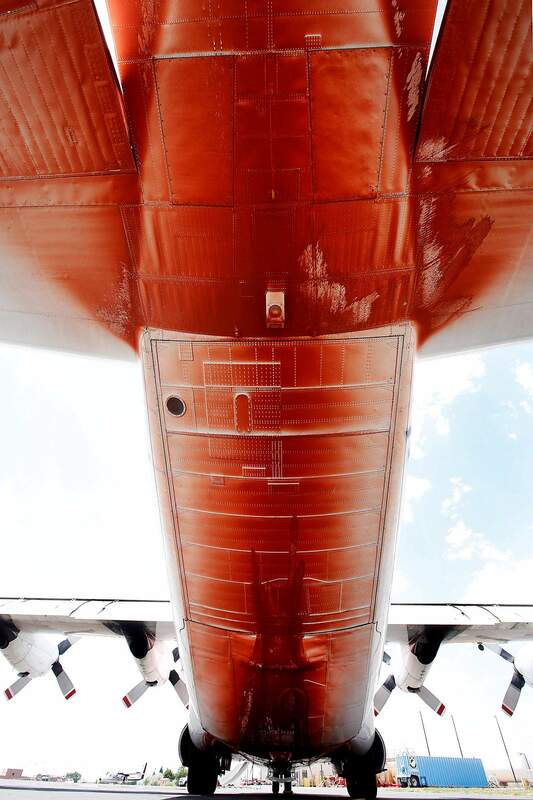 Fire retardant covers the back of the C-130 Hercules heavy air tanker June 15 at the Durango Tanker Base. Crew members of the C-130 Hercules heavy air tanker stationed at the Durango Tanker Base always have their bags packed so they can be moved to another tanker base at a moment’s notice. The Durango Air Tanker Base has already used more than 400,000 gallons of retardant this wildfire season to date, June 15, the most in a summer period since the Missionary Ridge Fire in 2002. A total of 16 planes have made 121 flights from the tanker base on the 416 and Burro fires, about 75 percent of the base’s air traffic. Planes have been in the air for 85 hours, and have dropped a total of 239,382 gallons of retardant. “It’s been crazy around here,” said Jon Frisch, manager of the Durango Air Tanker Base. The air tanker base opened in July 2002, the summer of the Missionary Ridge Fire. The money for the base was secured by former Sen. Ben Nighthorse Campbell of Ignacio. 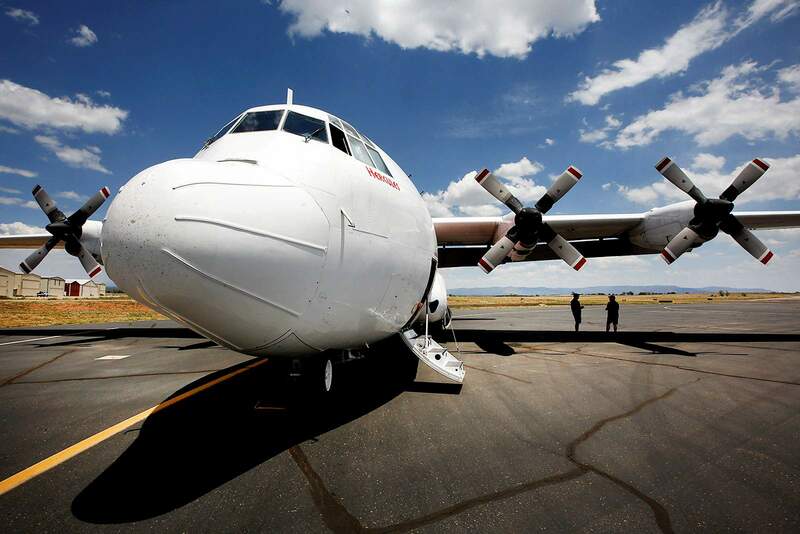 Before the base was formed, air tankers flew in from Grand Junction, Jefferson County and Albuquerque. One of the heavy-tankers at the base is a C-130 Hercules. Built in 1981, it was originally used by the Navy before it was used to fight wildfires. 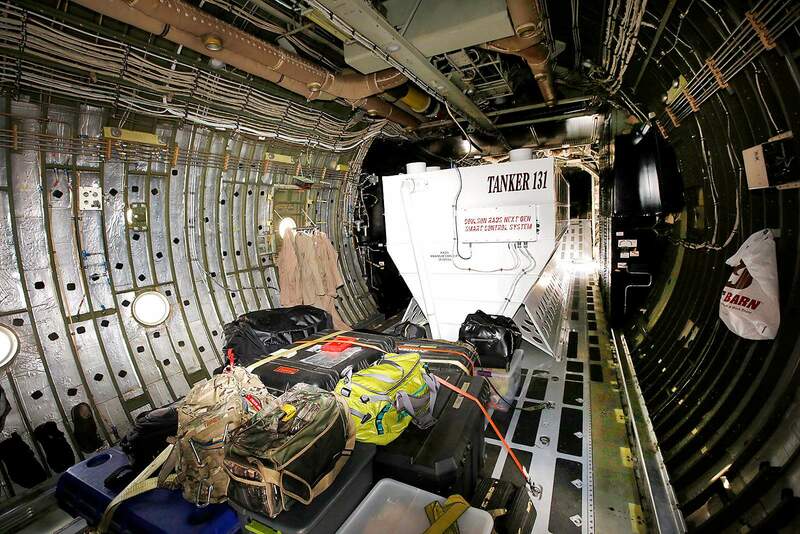 The tank in the plane holds 4,000 gallons and 36,000 pounds of fire retardant. Each trip takes about 30 to 40 minutes and they can do up to five drops in one trip. Then they have to refuel, which takes about 20 minutes. Though the plane is nearly 40 years old, it is not short on modern technology. A computer system knows who is in what seat, who pushed the button that dropped the retardant and the GPS coordinates of the location where the retardant was dropped. This information is stored and processed in real time. Bill Tinney is the co-pilot of the plane. His company has a federal contract that allows him and his crew to fight multiple fires in one flight pattern, and air tankers like the C-130 Hercules typically get called in to fight the highest priority fires. He has already fought 20 different wildfires this year. Aerial assaults have been intermittently used during the 416 Fire for a number of reasons. Gusty winds can cause the retardant to drift, making it hard for pilots to make accurate drops. Retardant also isn’t effective without firefighters on the ground to build fire lines, and the rugged terrain has made it difficult to put crews in those locations. There are different coverage levels on a scale from two to 12 that the plane uses to drop retardant on fires. Lighter fuels require lower coverage levels, while heavier fuels require higher coverage levels. For the 416 Fire, pilots have been using levels six and 10. It’s important to use the correct coverage level and the right amount of retardant. “Too much retardant will damage trees, and if you don’t use enough retardant, the fire will go right through it.” Tinney said. Flinders attends the daily morning briefing at 6 a.m. to be aware of firefighting operations for the day. Based on the daily objectives, fire officials can order any aircraft they deem necessary. “There’s lot of emails and follow-up communication, just so that we are very organized so we can be highly effective,” Flinders said. The tanker base makes sure that pilots are prepared to fly at a moment’s notice. The pilots are at the air base until they get a call. When they get the call, their federal contract requires them to leave within 15 minutes. Tinney estimates they usually leave in six minutes. “There’s a lot of sitting around, but we’re always standing by ready to launch,” he said. Tinney is one of three people in the plane during air drops. He can serve not only as the co-pilot but also as the flight engineer. The flight engineer is in charge of making sure all operations are actively working, and aiding the pilots in scanning for potential hazards. It’s the duty of all three on the flight to be aware of their surroundings and stay clear of other aircraft fighting the fire. The aviation is usually the most expensive part of firefighting operations because of the specialized equipment, Frisch said. A flight’s expense depends on the aircraft, the contract and the number of gallons it is dropping. After 100,000 gallons of retardant that this base gets rid of, the rest costs only about $1 per gallon. Drones have not been a major problem so far for aircraft fighting the 416 and Burro fires, Flinders said. “I think the public messaging and our prevention team has done a good job of getting that message out there and the public is listening,” he said. Flinders also encourages all private pilots to avoid flying near fire areas with heavy aircraft. Fire tanker base The Durango Air Tanker Base has already used more than 400,000 gallons of retardant this wildfire season to date, June 15 , 2019, the most in a summer period since the Missionary Ridge Fire in 2002. The Durango Air Tanker Base has already used more than 400,000 gallons of retardant this wildfire season to date, June 15 , 2019, the most in a summer period since the Missionary Ridge Fire in 2002.